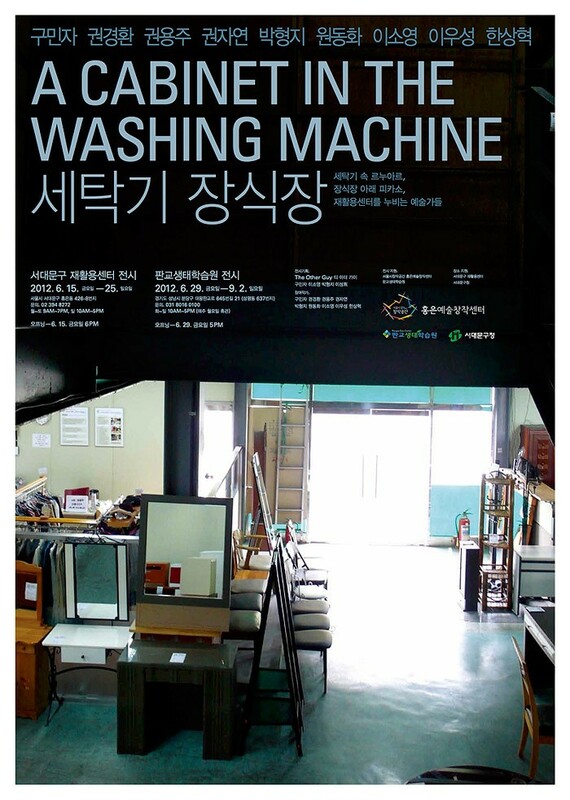 The recycling centers in districts of Seoul are occupied with second-hand furniture and electronics. This project first began when Soyung Lee and Minja Gu discovered the recycling center in one of the crowded streets of Gangnam in Seoul. The recycling center was vibrant with local customers and the stacks of second-hand chairs, furniture, and electronics but still had an appearance of a large warehouse situated near Gangnam subway station. The project then developed and changed its form in the period of two years since the beginning of the project in 2010. The exhibition was finally realized in 2012: Another artist, Hyungji Park, and a curator, Sunghui Lee, joined the project, and this temporary collective was named, "The Other Guy." The venue changed to another recycling center in Seoul, and nine artists participated in the show at the recycling center of Seodaemun-Gu(the district of Seodaemun) with the support of Seoul Art Space Hongeun and the district office of Seodaemun-Gu. The archival form of the show was held soon after the exhibition at the gallery in Pangyo Eco Center sponsored by Pangyo Eco Center. 서울의 지역구마다 운영되는 재활용센터에는 쓰다 버린, 혹은 팔다 남은 가구들과 가전제품들이 곳곳에 쌓여있다. 이 프로젝트는 구민자, 이소영이 강남역 한복판에서 재활용센터를 발견하면서 시작되었다. 강남역의 활기차고 혼잡한 거리에 자리한 재활용센터는 백화점이나 일반 상점과 다른 모습으로 창고와 상점의 불확실한 경계에서 손님들을 맞이하고 있었다. 쌓인 물건 사이로 사고 팔리는 물건들이 끊임없이 순환하는 재활용센터의 구조 안에 미술작가들의 작품이 함께 하면 좋겠다는 생각에서 기획한 이 프로젝트는 2년여의 준비 동안 변화하며 조금씩 형태를 갖추었다. 이후, 작가 박형지와 큐레이터 이성휘가 참여하면서 프로젝트팀 '디아더가이'로 홍은예술창작센터 레지던시에 참여했다. 2012년 홍은예술창작센터와 서대문구의 도움으로 서대문구 재활용센터에서 열린 전은 9팀의 작가들이 참여했다. 이후, 판교생태학습원의 지원으로 아카이브 형식의 전시를 판교생태학습원에서 열었다.